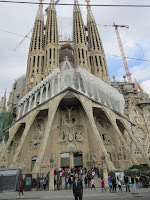 Here are some pics from my first time visiting Barcelona...enjoy! Oh man, I haven't seen a cathedral like that for fifteen years. So awesome. That rainbow candy store is a great shot too.